Age categories : Under 8 (7 and younger); 8-11 years old; 12-15 years old. The Toyota Dream Car Art Contest is held to encourage and inspire creativity in children who are our future. Amazing ideas are born from dreams. We hope that drawing their dream cars lets the children not only have fun but also realize how vital their dreams are. As a manufacturer, Toyota strongly believes in the importance of dreams and is committed to supporting children’s dreams. ** How will your dream car make the world a better place? Every year thousands of children share their dreams with us. ** Join them and discover just how powerful dreaming can be. ** Remember, the National Contest is followed by the World Contest. ** The participants can win great prizes locally, get opportunity to visit Japan for an Award Ceremony. ** In addition, young dreamers are given tours at a Toyota factory and can experience various aspects of Japanese culture. ** October 2018 – March 2019. ** The contest timeline and requirements may vary in different countries or regions. ** Please confirm the contest details with the TOYOTA distributor in the country or region of your residence. ** The contest is open to anyone in these countries, aged 15 years old or younger. What can I use to create my artwork? ** You can use any standard drawing medium you like. Perhaps you could try coloring pencils, crayons, watercolors or markers Our only restriction is that you don’t use digital tools to create your artwork. ** We’re looking for hand-drawn artwork, which shows “Your Dream Car”. ** Remember to include a background that supports your idea. ** Your picture could be seen all over the world, so make sure people from different cultures will be able to understand it. Please send artworks to the contest office according to the following guidelines. ** The color, material, and shape of paper can be chosen freely. ** Drawings will be displayed/retained in a frame. Therefore, a drawing including a form itself must not be thicker than 5mm. ** Any drawing materials can be used, such as color pencils, markers, crayons, or paints. ** Collage or cutout pictures will be allowed for plane drawings, excluding ones making other artworks dirty or requiring special care in handling. ** CG artwork created on a computer or similar device will not be accepted. ** Collaborative artwork drawn by multiple individuals will not be accepted. ** Artwork created by a person other than the participant. Please prepare an entry form. Download the entry form from the following website, Toyota South Africa website toyota.co.za) or obtain it from a Toyota dealership. Please fill in all the necessary items on the entry form, and securely attach it to the back of your artwork. Please see the “Entry method” provided on the entry form for more detailed methods. (1) Permission of the parent or legal guardian is necessary when entering the contest. ** The top five contestants win prizes on a national level and the top three in each category are subsequently entered into the international competition which is judged in Japan with Akio Toyoda. 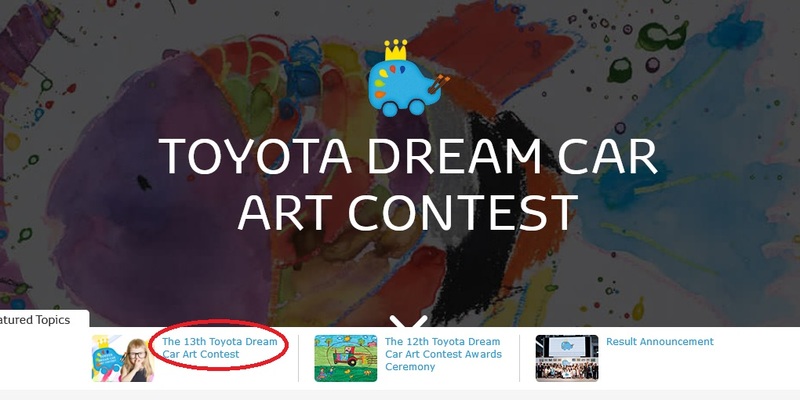 The Toyota Dream Car Art Contest is intended to create opportunities for children throughout the world to develop their interest in cars and help them feel the joy and importance of having a dream through drawing pictures of their dream cars.